Some call them woodworking 'tricks', but I call them micro inventions -- simple, but non-obvious inventions that some wood worker discovered hundreds or maybe thousands of years ago -- that are passed down from worker to worker because they are so darn useful. They're easy to recognize when you see them -- they make you slap your head and utter the word 'Wow'... at least that's the effect they have on me. Here are three that I used just this week. Notice how they all reduce the complex mathematical problem of capturing a shape or angle to a simple tool. Brilliant! The first is from my new friend in Brazil, Diego de Assis. 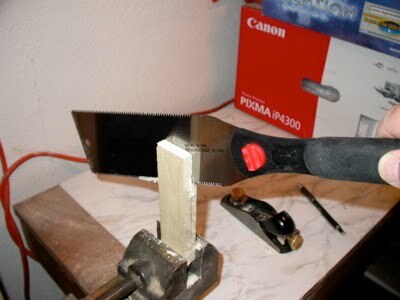 I have been trying to learn the art of sharpening edge tools like planes and chisels. Unless you are a wood worker, you would not believe the number of tool-sharpening 'systems' on the market, each one more exotic and expensive than the next. One of the problems of sharpening is honing the blade at precisely the right angle. A few degrees can make the difference. Despite my devotion to the philosophy of Economy taught by my mentor, the original American genius, I admit to lusting after a complicated honing guide, equipped with brass adjusting knobs and a darling little roller... you know the type. A block of wood, a long screw, a couple washers, and a wing nut are all you need. 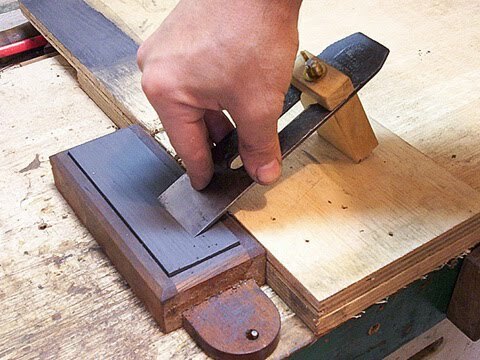 The angle (notice the mathematics captured by this simple invention) of the sharpening bevel can be adjusted by moving the guide up or down the slot, or by using a shorter or longer guide. 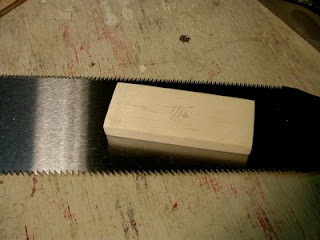 It's easy to imagine a similar tool for sharpening a chisel, and I plan to build one this weekend. Why would you need anything more? The second invention solves an even more complex geometrical problem: How to cut a stem rabbet when all you have is the rabbet line from the profile plan, and the angle of the side planks from the half-breadth plan. 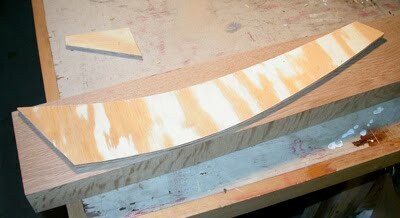 Here is what you start with: the rabbet line, and the angle that the outside of the planking strikes the stem, and thickness of the plank. Here is what you want to end up with: a nice, right-angle groove in the stem that the plank fits into perfectly. Just to be clear... the rabbet is the V-shaped groove in the stem, between the rabbet line and the bearding line, that the plank fits into. 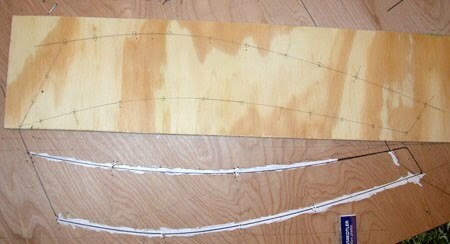 But how is a poor boat builder to draw the bearding line, which is not specified on Cabin Boy's plans? And once drawn, how is he to cut the rabbet at precisely the right angle? You can find the bearding line by holding a chisel, flat side down, at the correct angle (using a bevel guage, not shown), and then holding a 'fid' to the back of the chisel. Where the fid touches the wood is where the bearding line must be. So, what is a fid, you ask? It's nothing more than a right rectangular hexahedron, the same thickness as the plank you will use, in my case, 7/16"
Where do you get a a right rectangular hexahedron? You make one, of course! I made mine out of white pine, using my amazing new Japanese pullsaw, which is even better than my bandsaw at making clean, near-right angle cuts. I cleaned it up using a small block plane. I'll talk about using the fid to actually cut the rabbet (which I haven't done yet), in a future blog post. 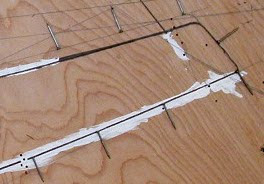 Finally, after carefully lofting a part of the boat, like the stem, on the lofting board, how do you 'pick up' the pattern, so you can cut out the actual part? Well, the words 'pick up' have entered the boat building vocabulary because of another brilliant micro-invention, that must have been discovered around the same time as lofting itself, if not earlier. That is, several hundred years ago, in the great Age of Sail. This is the simplest invention of the 3 I discuss here. In fact, it might better be called an Innovation, because it probably improved on whatever method was used previously. The innovation consists of laying small nails on the lofting board, points out, with their heads aligned with the lines of the part you are trying to 'pick up'. This photo also demonstrates why lofters should use old-fashioned pencils, NOT the markers recommended by some who will be left unnamed. The white lines are made by White Out (how embarassing.) The nails are laid on the correct lines. 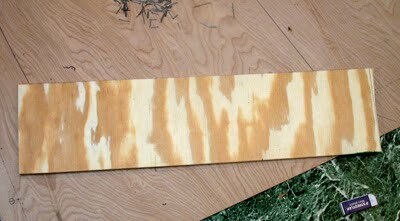 Then, you step onto the plywood board, and carefully squash the whole piece onto the nails, so that the edges of the nail heads press into the plywood making little indentations. Then you 'pick up' the plywood and circle all the indentations, so you don't lose them. In my excitement, I forgot to take a picture of this stage, however, you can see them on the next photo, where I have nailed the same nails into the plywood board, one into each indentation. You can then bend a batten around those nails and draw a line. 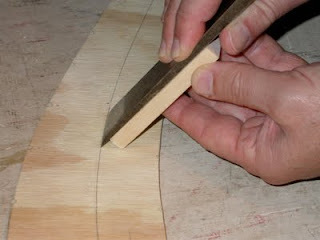 After you've connected all the dot's you've picked up from the lofting board, just cut along the dotted-line. 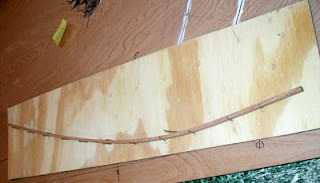 The result is a pattern that is precisely the same as the one drawn on your lofting board. As usual, experienced boat builders won't have learned anything new in this blog post... except, perhaps, a new sense of wonder at these marvelous micro inventions... okay, tricks... that connect us to the really brillant people who discovered these simple, but mathematically complex techniques, so very, very long ago. Very well done, John. You convey an exciting sense of wonder at these discoveries. I am always surprised that traditional boatbuilding is so deeply invested in geometry, and that the builder has to be able to effectively think in three dimensions when lofting. Romain, it's interesting that you raise this issue, because before I tried it, I was worried that the nails would roll around under the pattern board and get out of place. But in practice, this wasn't a problem. Not worth the extra work filing off half the heads, though it's a cool idea.